In my South Korea Grand Prix race report for AUTOSPORT magazine I wrote that Ferrari had slowed Felipe Massa down under the safety car to help minimise the position loss of Fernando Alonso's lost wheel nut at his pitstop, which came a lap after Massa's. For the purposes of clarity, at no stage did we accuse Ferrari of team orders in so doing, even if the action could be interpreted as such. Our position on team orders is that it is a natural part of racing anyway and even the FIA has accepted that in the midst of a championship showdown, they are inevitable. Far from attacking Ferrari, we fully support its actions in doing what it did in South Korea. Even though the team is officially saying it did not, in fact, slow Massa and that the 2.5 seconds he lost to Lewis Hamilton at the pitstops was due to caution on his part, the team has to say this because of the ridiculous hoops the written regulation forces the teams to jump through in order to be officially clean with regard to team orders. 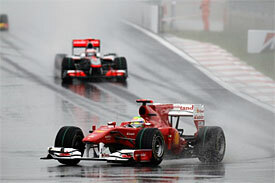 Be assured that the information that Massa was slowed came from inside the Ferrari team. It is the unearthing of such intelligence that separates in-depth reporting from the re-writing of team PR sheets. It would not be written if there were not an impeccable source. Furthermore, the inside information is backed up by the race history chart around the safety car period for the Buemi/Glock incident. Comparing lap 30 to 32, Massa loses 2.5s to Hamilton. Only 0.2s of this is accounted for by their in-laps (lap 31). The rest comes on the out-lap – strong enough supporting evidence in itself but what even the race history chart does not show is that almost all of the lost 2.3s (2.5s minus the 0.2s lost on the in-lap) came in the last sector. Had Massa not slowed, he – and not just Hamilton - would have leap-frogged ahead of Alonso as a result of the Spaniard's wheel nut delay. For the full race report, read last week's AUTOSPORT magazine, available in digital form here.